What does Ebenezer REALLY mean?? Ebenezer Baptist Church was founded in 1778 near the site on which it stands now. Richard Furman, Evan Pugh, and Timothy Dargan were among the leaders who planted this church and began a tradition older than the City of Florence itself. The name “Ebenezer” comes from a compound Hebrew word meaning “Stone of Help” raised in 1 Samuel 7 by the Children of Israel to remember a great defeat God handed them over the Philistines. In a time of great danger, God delivered them. This “Ebenezer” raised by the Children of Israel would always remind them of that horrific battle and great delivery!! I look at this picture and am reminded of yet ANOTHER meaning of Ebenezer. We know the academic meaning and we know the pop-culture meaning and even the local Florence meaning. 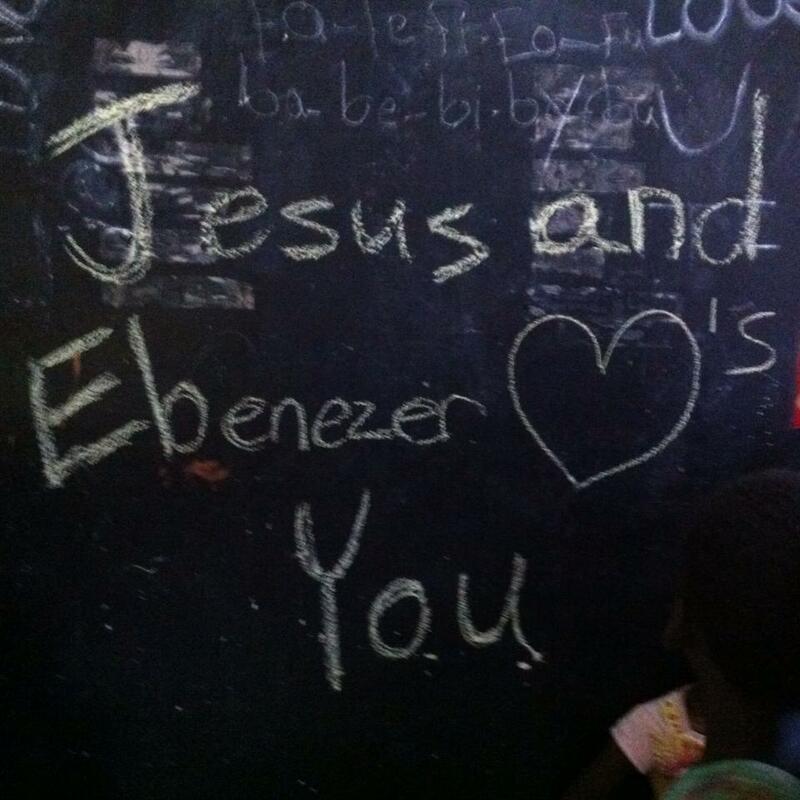 But to now THOUSANDS of people in Colon, Honduras, Ebenezer means something totally different. It means HOPE. It means LOVE. It means that God has not forgotten them and that there are people who care enough to work hard, pay with their hard-earned money, take time off from their jobs and lives, and come to Honduras. Come to this land those folks call home and make a difference. Come and provide healthcare that almost none of them could afford, come and stand up for a bunch of orphans who could never stand up for themselves, and come tell everyone who will listen that Jesus Christ loves them and wants to save them. And when I realize that, I feel like the most fortunate pastor in the world. Because these Ebenezer people … they are MY people. And when I see them loving on the world just as Jesus commanded us to love. I get really proud. And love them even more!!! Yes, it really MEANS something to be a part of this church. And I am thankful!! First of all, Automated Church Systems software does a pretty good job in presenting statistics. And, yes, you can run reports without names. Second, I didn’t even run the report. I asked someone else to run it for me. And third, I take what I say in the pulpit quite seriously. If I tell you something about me, it is TRUE!! Because, a long time ago, I decided if I say something in the pulpit, it had better be true out of respect to my Lord and Savior. Call it an ethics thing, but I would fear my fate if I stood and said something I knew to be untrue. I am not perfect, but I have this healthy fear and respect of God Almighty. Also, a long time ago I made a decision that I do not want to know who gives what in our church. Yes, there are other pastors in other churches who DO know what people give. That is between them and their churches. A very wise professor in seminary, many years ago, told me that I really DO NOT want to know. He was/is right!! I believe in that so much that it made our fundraiser angry a few years ago when he was encouraging me to know some things about individuals and their giving habits. I told him then of my commitment not to know these things. He told me he had never been in a church where he didn’t know such things. We had to agree to disagree. I know that one day I will stand before God and He will hold me accountable for everything I have said from each pulpit in which I have stood. Seriously, It is TRUE!!! The role of the prophet in the Old Testament was to speak such truth. There were times when they brought GREAT news from God. And there were times when they had to stand before kings and governors and tell them the truth from God, and at times even put there own lives at risk. We talk about the average tenure of a Southern Baptist minister to be around 18 months … Sometimes the LIFESPAN of a prophet (after delivering such news) was much less!! No pastor worth his salt ever enjoys bringing bad news to his flock. Yet there are times when we ALL need to turn back to God. We all need to give our lives and everything in them COMPLETELY to Him. We all need to give Him the glory due His name. Do you ever feel like you are running on empty??? Or, there is something in your gas tank, but it cannot be more than vapors? This has been a great weekend at Ebenezer. But it has been one of those weekends. Once again, our Honduras rummage sale was a great success. And, even though it is a lot of hard work, there is a fun factor in spending time with the team. And it can be fun to talk to people during the sale: Some of them make it really interesting. On the other hand, I KNOW I would never survive in a career of retail sales. Yesterday was a GREAT DAY at Ebenezer as we celebrated both the Lord’s Supper and Baptism in our morning worships. Meetings and worship last night. And today, a full plate of stuff to do and a bunch of people in the hospital. Top it all off with a Men’s Ministry event tonight and I will officially turn into a zombie by 9pm today!!!! But it will all be alright … God WILL get me through this … AND an extra cup of coffee (OR FOUR).